About/Contact | A contemporary gallery of art, design, film and music. 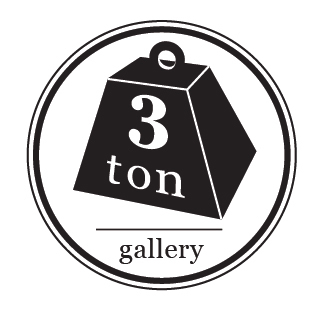 3 TON GALLERY was established in San Francisco and focuses on contemporary works from emerging and established artists across the United States and Internationally. Now based in New Orleans, the gallery showcases a wider variety of work from artists and architects, to musicians and filmmakers. Occasionally, it simply presents interesting pieces found on the web that either asks a question or nicely answers another. ERIC ULRICH. I went to art school and have been a designer at large and small agencies for years, but I’ve been making art since I was old enough to ride a plastic horse. In between gallery shows, I often do commissioned works for a wide variety of people, including collectors and interior designers in everything from homes and restaurants, to hotels and businesses. My current mixed-media work incorporates photographs, found objects and torn paper along with with silk screened images and acrylic paint. I believe creating site-specific pieces that have a strong and unique point of view is a much better way to enhance your overall space instead of something deviod of comment.